The decision of a Dutch art committee to back one of the Netherlands’ most prestigious museums in its attempt to hold on to a prized painting obtained from a Jewish family in 1940 has sparked an international outcry over the fate of Nazi loot across Europe. The binding ruling against the descendants of Emanuel Lewenstein has come under heavy criticism after it emerged that the committee had taken into account the need to maintain the “public art stock”. The reasoning has been described as a “step back” by Stuart Eizenstat, the US diplomat behind the Washington principles, a 1998 agreement under which 44 countries including the Netherlands committed themselves to the return of 600,000 pieces of art stolen by the Nazis. At a conference in Berlin last week to celebrate the second decade of the principles, Ronald Lauder, the president of the Jewish World Congress, expressed concern and suggested Dutch moral leadership on the issue had been dented. The Netherlands is one of only five governments to have established restitution bodies. 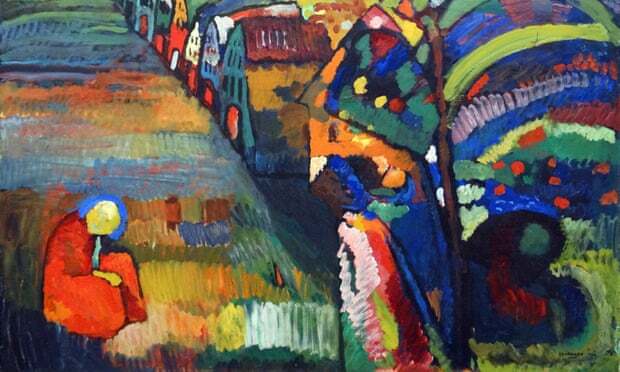 The claim by Lewenstein’s heirs to a 1909 work by Kandinsky known as Painting with Houses was first made in December 2013 and it has taken five years of research and legal argument to settle. The descendants argued that the expressionist work was sold to Amsterdam’s Stedelijk Museum under duress at auction in 1940, five months after Germany invaded the country. The unnamed heirs said the watercolour was purchased for a “modest sum” and the sale was not made in good faith. The committee, which was established by the Dutch government in 2002, and comprising lawyers and art historians, confirmed the sale was made between 8 and 9 October 1940 at the Frederik Muller auction house in Amsterdam, and said the transaction should be seen in the context of the times and that the Lewenstein family would have had a clear understanding of their probable fate under the Nazi regime. However, the committee ruled that there was evidence to suggest the family had long been in financial difficulties. It said Lewenstein’s immediate family had a good relationship with the museum after the war and did not try to retrieve the painting. It additionally stressed the need to assess in its deliberations the “respective importance of the work to both parties and of the public art stock” and to “take into account the interests of the applicant in restitution of the artwork and the interests of [Amsterdam] city council in retaining the work”. The municipality of Amsterdam argued in its rebuttal to the family’s claim that the piece was important to the museum as it was “on permanent display and … the essential link in the limited overview of Kandinsky’s work in the museum’s collection”. The ability of the restitution committee to take into account the state of the stock of public art was introduced in 2013. The Dutch restitution committee is already at the centre of a lawsuit filed by an American heir to a former Jewish art gallery partnership. Bruce Berg, a grandson of the late Benjamin Katz and a great-nephew of the late Nathan Katz, brothers and partners in the Firma D Katz partnership, alleges that 143 paintings are in the wrongful possession of the Dutch government and a number of private and public museums in the Netherlands. The case being heard in the US district court of South Carolina involves works by Dutch old masters such as Ferdinand Bol, Pieter Claesz, Jan Steen and the Rembrandt school. It is claimed that the paintings were sold or traded under duress to representatives of the Nazi regime between mid-1940 and 1942. Joel Androphy, a lawyer acting for Berg and Katz, said it was taking the legal action as previous claims made to the restitution committee had been “largely denied”.